How do you make the well-worn platform shooter genre feel fresh and exciting? 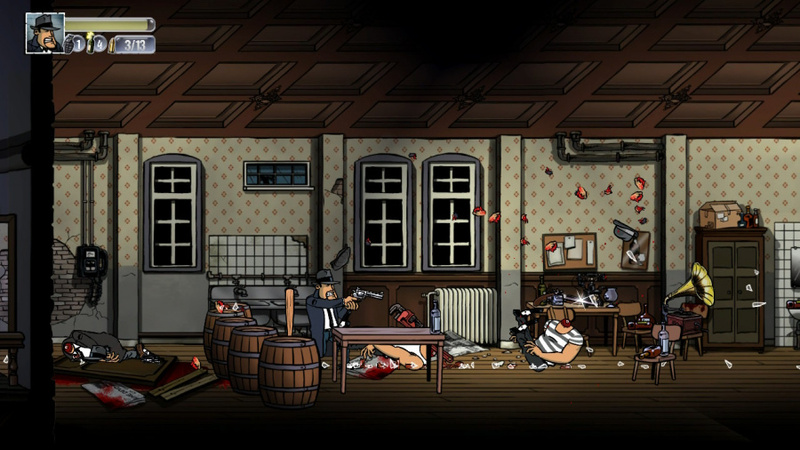 Our answer wouldn't necessarily be to mash together equally well-worn zombie and gangster tropes, but that's what the developer of Guns, Gore & Cannoli has come up with. The game casts you as Vinnie Cannoli, a prohibition-era mob enforcer who's equal parts James Cagney, Silvio Dante and Fat Tony D'Amico. In other words, he's a walking Mafioso cliché. Faced with the kind of alcohol-induced zombie apocalypse you only usually see in provincial English towns on a Friday night, Vinnie sets off to do what he does best - shoot lots of stuff. There is more to the plot, but to be honest we've already forgotten what it is. All that matters is that you understand the concept of running right, clambering over obstacles, and blasting anything that moves. It's a formula that will be familiar to anyone who's ever played a Metal Slug game. Your initial target is the undead, who come in a variety of shapes and sizes. There are zombie cops who unleash random shots from their sidearms, burly gridiron players who steamroll right through you, and whip-wielding exotic dancers who, well, wield whips. After a few levels you'll start to face human opposition, who are a little smarter and thus more interesting to face. These goons take cover, shoot back, lob grenades and generally force you to fight more cautiously. The game's guns pack quite a punch. You'll steadily amass an armoury of weapons, including pistols, shotguns, machine guns and flamethrowers. Firing these is bound to ZR, with R set to reloading. 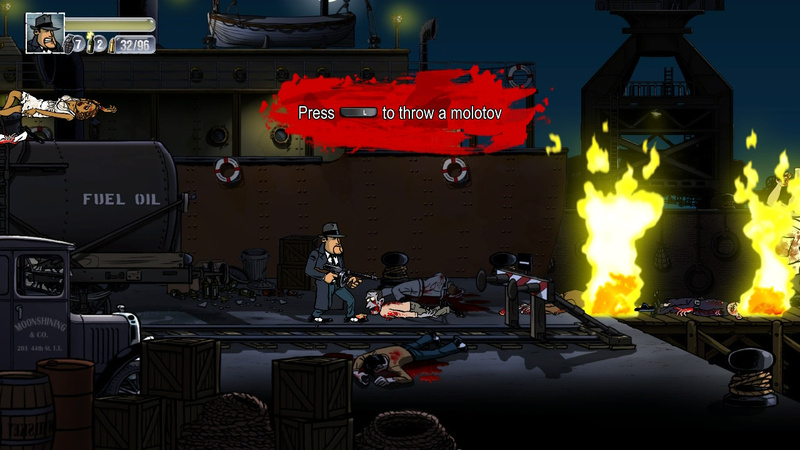 Over on the LR and L buttons you have your grenades and Molotov cocktails, which become essential when flushing out cowering mobsters and soldiers. 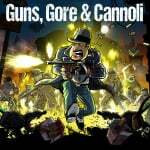 In Guns, Gore & Cannoli's favour, it constantly forces you to switch between weapons on the fly - whether due to an empty clip (reloads take a while) or the nature of the threat in front of you. The twin-barrelled shotgun has great stopping power, for example, but won't be of much use when the clapper-board zombie shuffles along. You're better off switching to a pistol and going for a headshot. For all its visceral attributes, it's odd that the combat starts to feel so samey so quickly. Running right and blasting stuff simply becomes a bit of a chore before too long, and we found that we play the game in brief bursts as a result. Perhaps it's down to the crudeness of the combat. While there's a certain satisfaction to popping zombie heads, encounters all tend to smoosh together with a similar tone and pace. Fights take place on a single plane and at the same time close to medium distance. You can aim left and right, but not up and down or diagonally. You'll often need to physically stand higher than your target (on a staircase or a box, say) to score a reliable headshot. 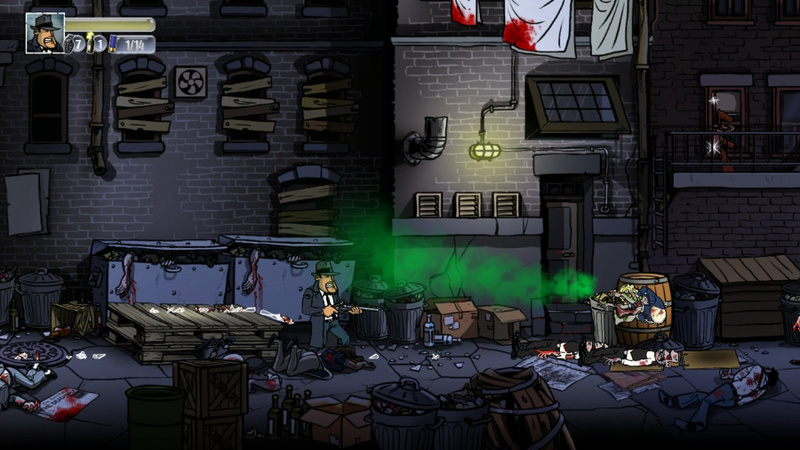 On the plus side, the graphics are sharp and expressive, with a cartoony art style that does its best to sell the whole 'gangster zombie' premise. It all looks really slick and stylish, even on Switch's compact display. It's a shame the same can't be said for game's writing and characterisation, which is universally shallow and frequently unpleasant. We find ourselves wishing to mute Vinnie's repetitive, casually psychotic chuntering from a very early point in the game. It's neither witty nor funny. Perhaps the best way to play the game is with the volume turned down or off, and with four players contributing their own boisterous soundtrack. If you've got the control pads to spare, Guns, Gore & Cannoli is just the kind of brainless, instantly gratifying nonsense that could well spice up a multiplayer gaming session - in between extended bouts of something more substantial. 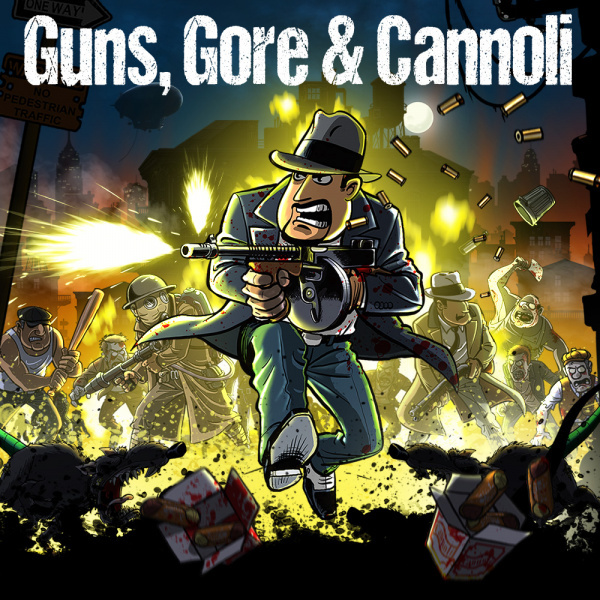 Guns, Gore & Cannoli is a solid shooter with slick graphics and crunchy combat, but it's a little too crass and one note for its own good. Like the titular pastry, it really needs to be consumed in moderation. Guns, Gore & Cannoli is a reasonably proficient side-scrolling shooter that grows somewhat tiresome through repetitive combat and unpleasantly clichéd character design. It's an enjoyably brainless diversion - especially in multiplayer - but it's one that only really works in small doses. Shiryu seal of awesome 8/10! Get some friends over to fully enjoy the madness. Seems annoying that you can only shoot forward. Otherwise, I like the look of this one. It would infuriate me not being able to fire diagonally. The graphics remind me of Dead Connection. That's a game that ought to be revisited. I love the look of this but I just don't think I would ultimately play this more than a few min and get bored... I hope those who buy it love it though as the game looks fun! I feel like the criticism here could easily be applied to similar games that rely on super-macho soldiers instead, such as Contra and Metal Slug, and I still enjoy those games a lot in multiplayer. I'm probably getting this one before I go visit my hometown near New Year's Eve. Got to say the art style is excellent. Well above average for an indie. Fun game with really good art, better than a 6 IMO. This is better than a 6. Played this on PS4 like a year ago. 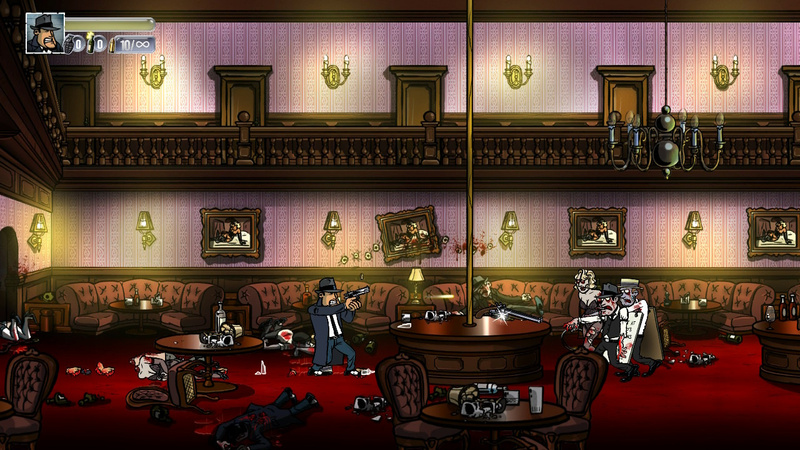 It's got a great art style, an over the top Mafia + zombies parody story. The main character is hilarious in his stereotype mafia Brooklyn voice. Great game. It does have some annoying difficulty spikes, but overall great little gem. I still think it's unfair to have ratings based on all games rather than pro rating indies or digital vs. retail etc. I mean as an indie 2D sidescroller/shmup this looks pretty fun and a lot of folks here that played it before say it is, so for what it is, the 6 seems too low. Yet compared to BotW, Odyssey, Xenoblade 2.....how could a small game like this even reach 5 if those represent 9's and 10s? And at face value that would look like "all games that aren't big retail games just aren't nearly as good" without factoring in their lower price point. Review categories I think would really help all ends of the industry, with indies, or price points setting review categories. I strongly agree. A 7 or maybe an 8. @NEStalgia I strongly disagree. Production values are merely one of many factors (gameplay loop, mechanics, writing, setting, worldbuilding) that go into how good a game is. For example: out of the Switch games that came out this year, I would rate Stardew Valley, Steamworld Dig 2, Axiom Verge and plenty of others higher than, say, Xenoblade 2 or ARMS. I get part of what you're saying - this game looks higher than a 6 for me - but this is a matter of this particular reviewer's impressions, not an overal rule of thumb. This very site has given plenty of high ratings (even 10s, like in the case of Axiom Verge) to deserving indie games. This game is kinda old now and it has been mediocre since it was released. Kind of surprised they even bothered with this one. The game gets marked down because it's a bit cliche´. Let me know if you've heard this one. A bald marine goes into battle with (insert aliens, mad scientist, warlord etc here) and saves the entire planet on his own. Yeah, I might download this BECAUSE it's a bit cliche´. Played this on PC and really enjoyed it. It’s underrated in my opinion and better than a 6. I would say 7.5 is more like it. Very funny and it’s a blast when the zombies splatter gore all over the place. I recommend it for the short bursts of fun action. And the sequel to this game is coming out soon and will enable you to shoot diagonally, which I’m sure will improve overall gameplay. This game is 4 years old and the developers kept promising a WiiU-version. When they finally didn't deliver, they blamed the power of the WiiU. Quite funny as there are plenty of mych more graphically heavy titles available for the WiiU. Not Bad. With this scoring policy 'not bad' is a bit of a cop-out. I think 10 is to many options, we have to many bottom feeder scores and 6 is a dumping ground for a lot of games. Have five star 🌟. It would force the reviewer to be more decisive in scoring. OK a few more games would receive top score not a bad thing, 3 is the middle ground. Buy if the price is right. An old game but still a fun game. Bad review. This is really a great side scroller shooter. Very fun, and also challenging. One thing in particular stands out and that's the Boss fights - the bosses are very good but very fair, so you really improve each time after every attempt, and you become more skilled and learn how to brilliantly beat the bosses, especially the final one. It's a gem of a game. Only downsides are that : (a) a little on the short side, but I hear the Sequel is coming; (b) controls could have been a bit more intuitive. The "y/x" button to change weapons kept confusing me, I kept pressing as if it was "reload". Highlights include the variety of weapons - brilliant choices, and a wonderful soundtrack. Why would anyone want to mute this game.